A glorious California Sugar pine -- the tallest of all the 111 pine species -- reaching almost 280 feet. Sugar pine cones are longest of all pines. This magnificent sample is almost 15 inches long ! Trees and their ancestors have been on Earth for over 350 million years. There are about 80,000 species of trees. Conifers were the first trees. They grow cones which contain naked seeds. There are approximately 629 species of conifers. The Ginkgo was the first to resemble a typical tree about 250 million years ago. Angiosperms comprise about 79,371 different species of trees. They require pollinators like bees, moths, butterflies, ants, bats and birds. Angiosperms grow fleshy fruits, which cover the seeds. An apple is an excellent example of an angiosperm fruit. Conifers rely upon the wind to spread their pollen. Angiosperms mostly depend upon pollinators to carry the pollen. New York City has about 5.2 million trees on public and private lands. 592,130 of those trees grow on New York City streets, according to the 2006 Street Tree Census. There are about 900 species of Eucalyptus. There are many terrific stories on trees in Love! Nature. Mature forests ensure drinking water for more than 1/3 of all cities or billions of people around the world. Mature trees protect cities from storm water runoff, and reduce cooling costs for homes, schools and factories by 40%. Mature trees provide invaluable shade and absorb tons of air pollutants. Mature trees and ancient forests are the most perfect carbon dioxide warehouses. For every 1 ton of ancient wood, 1.5 tons of atmospheric carbon dioxide was removed and 1 ton of oxygen given off. Ancient forests are a cornucopia of potent pain, cancer, coronary and other disease-fighting medicines. Ancient forests have other tremendous medicinal and spiritual values. Ancient forests provide crucial homes for animals, insects, invertebrates, fungus, bacteria, microbes and fresh water. It is time to protect all remaining ancient forests from rapacious humans. Would you like to know more on how to protect yourself and your family from cancer? 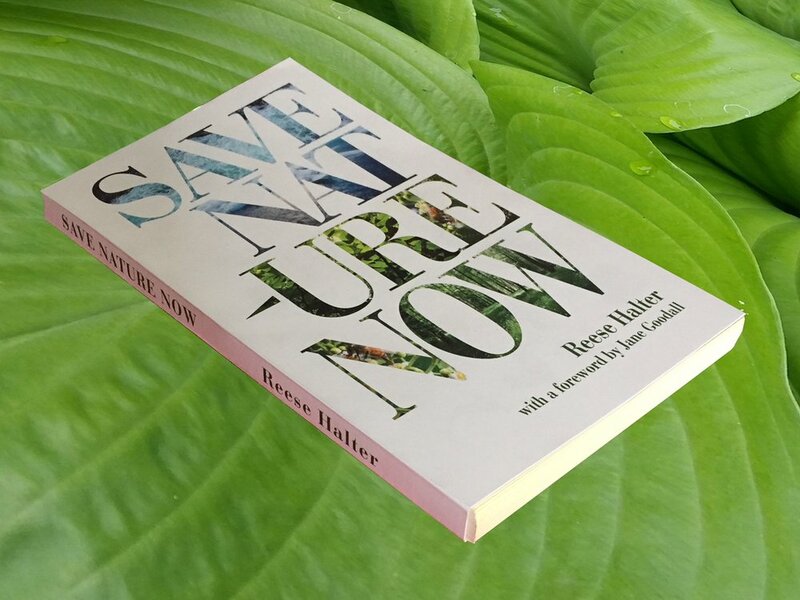 Purchase my book Save Nature Now and discover Nature's free medicines. There's an excellent chapter in Save Nature Now on what you can do to repair our planet. If you don't have to drive -- don't do it! Walk or ride a bicycle. When buying a car, purchase pre-owned electric or hybrid vehicles. When possible travel on public transit. Use that precious down-time to read. Save energy & save money by changing your incandescent light bulbs to LED lights. Plug all electronic devices with standby modes such as televisions, tabletop cable boxes, Xboxes etc. into a power-bar, switch the power bar off when equipment is not in use. You'll save 15% on your electric bill each month. Run the dishwasher, washing machine & dryer only with full loads. Operate washing machine using cold water setting only. Dry your clothes on a clothes-line. By lowering the thermostat in the winter to 68F or raising it in the summer to 79F, each household can save 350 pounds of carbon dioxide emissions annually. Set your hot water heater to 120 degrees F.
Ensure that your home has at least double-pane & preferably triple-pane glass windows (in northern environs); you'll save significantly on both winter/summertime energy costs. Make sure that the furnace, air conditioners & heat-pump filters are kept clean, replace filters regularly. Always use the energy-savings settings on refrigerators, dishwashers, washing machines, clothes dryers & all other appliances. Consider drying your clothes outside. The sun's ultra violet radiation destroys bacteria & fungi. Save 15% on the electric bill by not running the dryer. Take shorter showers. Try 3 instead of 6 minutes. Install low-flow shower heads & ultra-low-flow-toilets. Save water ! Use a push lawnmower & a broom instead of a fossil fueled lawnmower & leaf blower. Get a work-out & obviate creating incessant noise pollution. Convert your lawn to native water-smart plants. Plant food-bearing trees! They absorb carbon dioxide, create shade & habitat for urban critters & yield nutritious food. Please refrain from using chemicals in your yard. Make a bee-bath and replenish water daily. Go solar with lithium-gel battery packs. Many states encourage selling excess power back to the local grid. Database of State Incentive for Renewable Energy. Check your tire pressure monthly & change your air filter at least every 4 months. Carpool to work or events. Plan your errands, obviate using the car for several single-purpose trips. Refuse plastic bags. Instead, purchase organic cotton bags, reuse them again & again. Does your city belong to the U.S. Climate Mayors -- if not, why not? The purchase carbon offset when you travel. Most peeps in North America use between 10 and 24 tons of carbon dioxide each a year. Buy credits from The Conservation Fund, Solar Electric Light Fund, TerraPass, Native Energy or Sustainable Travel International. Plant lots and lots of trees !